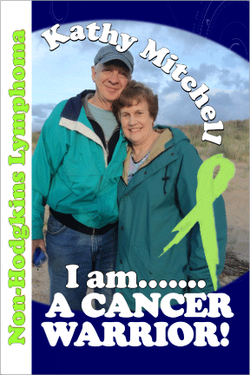 "My name is Kathy Mitchell and I am a cancer survivor. I was diagnosed with Stage 3 Non-Hodgkins Lymphoma in 2009. I received treatments at the Penn State Hershey Cancer Institute from 2009-2012 and am now in remission. I thank God and all my family and friends for all the support and love I received! Please join our fight to find a cure for cancer!"